SAND ISLAND, OAHU (HAWAIINEWSNOW) - Structures once intended for survivors of the Japan tsunami are now providing relief for homeless families in Hawaii. 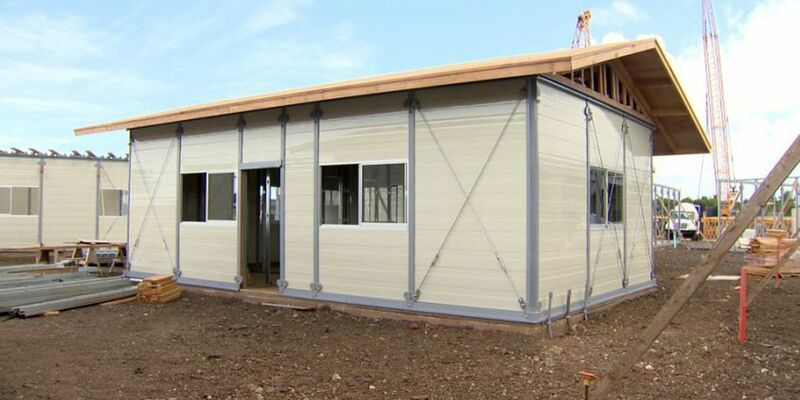 Dozens of volunteers did some heavy lifting Saturday to help assemble the modular homes at Sand Island. Materials for 30 of the structure arrived from Japan last week. They were originally used as emergency homes for tsunami victims. The project, named Kahauiki Village, will house people who've been in transitional shelters and are waiting for long-term affordable housing. "It's our kuleana, and our responsibility to help out others in need," Bank of Hawaii volunteer Kawika Fiddler said. "I think what's great about this project itself is everyone is kind of lending a helping hand, coming together as a community, and really helping out those who are not in the best position right now to get back on their feet." When the village is completed, it will feature 200 modular homes that will be on a 13-acre site. The homes are expected to provide housing for up to 800 people. Coordinators and volunteers hope to have the first families moved in by the end of 2017. "We are on schedule and we couldn't be more excited to start preparing these homes for families that are so appreciative of the opportunity to live in safe, dignified, affordable housing," said Duane Kurisu, founder of aio Foundation and the driving force behind Kahauiki Village said. Next week, military volunteers will continue to put together more homes to complete the first phase.